Climate change is not something that happens at a distance, to other regions and other people, but is a phenomenon that has an impact on everyone, everywhere. This is a lesson that grade 7 learners are being exposed to through a research project involving researchers from the North-West University’s (NWU's) campus in Vanderbijlpark. This action-based research will help local communities around Vanderbijlpark understand the impact of climate change on their environment specifically, says Irene Muller, lecturer in Physical Science in the School of Education Sciences. 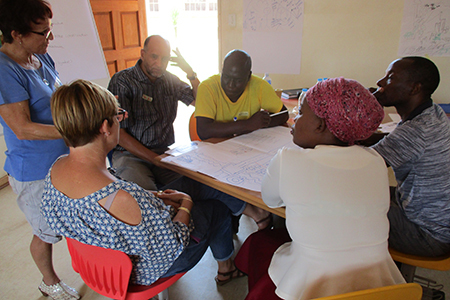 Irene is part of a research team investigating the impact of climate change on the communities around the NWU’s three campuses, under the research niche area Environmental Education for Sustainable Development (EE for SD). This work has links with the United Nations Educational, Scientific and Cultural Organisation (UNESCO). The UNESCO Global Action Programme on education for sustainable development has five priority action areas, one of which is to build the capacity of educators and trainers. This is an action-based research project which works with communities, teachers and learners to identify how they perceive climate change and the changes and problems in their immediate surroundings. “As facilitators we are participating in the research instead of playing a leadership role,” says Irene, who received her PhD during the May graduation ceremony on the campus in Vanderbijlpark. The project involves three schools within the communities of each of the NWU campuses. In Vanderbijlpark, Irene is working with the grade 7 learners and teachers at Parkridge Primary School. “The first step is empowering the educators as the results of the programme are dependent on the work that they do with the learners,” she says. The teachers will then look for different ways to incorporate climate change into the curriculum and their lessons, such as planting trees and investigating the properties of the water in small dams on school grounds. The learners will report on their experiences and share them with partner schools. “The research project aims to involve learners, facilitated by teachers and informed by community representatives, to conduct action research to enable them to identify and take action that will help local communities to adopt a stewardship role over vital natural resources such as soil, water and indigenous plants and animals,” explains Irene. During a later phase they will engage virtually with learners conducting similar projects locally and internationally. This will form part of a larger project with an international collaborator, Prof M Brydon-Miller of the University of Louisville, USA. The group’s findings will be published after completion of the project, but the real success will be seeing the change it will bring to the communities they serve. “Empowering a teacher with skills to take his or her class to an actual river, testing the pollution levels together and then talking about finding solutions that will be sustainable is what brings about a change in mind set and sustainable change in the environment,” says Luiza. The research niche area Environmental Education for Sustainable Development (EE for SD) aims to transform learning and training by researching the integration of sustainability principles into all education and training environments. The research strives to build the capacity of pre- and in-service teachers to deliver EE for SD effectively. They also aim to generate new knowledge at a higher education level among students and teachers in the basic education sector, as well as to promote environmental education subject matter knowledge, skills and pedagogy to stimulate trans-disciplinary teaching and learning in schools. Furthermore, they want to expose teachers to new teaching practices which encourage critical thinking and citizen scientists, and teachers’ commitment to teaching about climate change.